In addition to this website, the Black Strathcona project offers an interactive experience. By walking the neighborhood, following the map and using the QR Codes on the street signage, you are invited to download and watch the ten short video stories and experience the community first hand. To determine if your mobile device has a QR Code Reader, scan this code below. 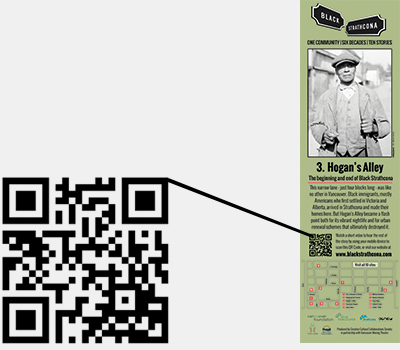 If your device downloads the video for Hogan’s Alley, you are ready to experience Black Strathcona interactively. If not, you can download a QR Code Reader for free from your mobile device’s app store.